Hello, and welcome to DNA's Emporium of Cherished Dreams, where dreams and memories meet. I deal primarily in Dream World and Nintendo Event Pokemon, though I do have other things for trade as well. The trade thread is not officially open, since I am (and have been) on hiatus from the Pokemon video game for a while. Activity will be reduced (I rarely check this) and the only trades I'd be willing to do at this time are for DW females I don't have, or when I request things from other people. You're free to pop in and say hi, but odds are I won't answer for a long while. ~ All of my Nintendo Event Pokemon for trade have been cloned with Action Replay. This does not affect the legitimacy of the event, but if you don't want one cloned...sorry. ~ I only accept legit Pokemon. I do not trade blatantly hacked Pokemon to anyone, and I expect the same from you. HOWEVER, I will accept cloned Pokemon. ~ Any and all Pokemon in my thread are untouched unless otherwise stated. ~ Please try to have proper spelling and grammar. If you have total disregard for the English language, odds are I won't trade with you. ~ If you want more information on any of my trades, don't hesitate to ask. None - let's keep it that way! ChillBill: My DW female Vulpix and Dratini for his DW female Sewaddle, Frillish, and Vullaby. Champloo: 45 of my DW females for several RNG'd stuff. Soft-reset for my Lightningrod Pikachu. Also some pending trades. Additionally, if you have any of the above Pokemon and they AREN'T level 1 (or they're evolved), I may take them, but they still have to be female and have the hidden ability. They're ranked in order of how much I value them, from lowest to highest. The name in bold in each list is the one I want the most from that list (except for Low, where there is no bolded name). A Deoxys with a nature and IVs that would go well with a Defense Form set. I MUST have this in a GEN 4 GAME, no exceptions. A Groudon caught in the Embedded Tower in SoulSilver. I MUST have this in a GEN 4 GAME, no exceptions. A Bold or Calm Chansey with Seismic Toss and Counter. If it's just Seismic Toss that's fine, but I prefer both. Random shinies. I like some more than others so I'll check your list. Any Nintendo Event Pokemon I don't have yet. plus any item that makes a Pokemon evolve - Stones preferred. I don't have the English Celebi yet. I'm trying to soft reset for a good one. The DW trade section is the primary bulk of this section. However, since my boxes in Gen 5 are generally more full, all DW Pokemon will have to be ordered upon request, i.e. I'm going to have to breed them first. I may already have some DW females in the boxes already, bred from previous trade requests; if that is the case, I'll let you know (when you ask) if I already have one. Note again, this section doesn't get updated very often; however, the contents of this section are basically all the DW Pokemon that are not on my wants list. Some of them aren't here, but if they aren't on my wants list, then they can be asked for. For convenience, since there's so many, they are listed alphabetically. Evolutions are not included in the list because it's implied. I've got all sorts of stuff in 4G for trade; I can get basically any Pokemon on request, but if you ask for a legend, it'll be given to you as a clone. If you want something, ask. I might be able to throw in an egg move or 2 if I can. Piplup Lv. 1, Timid - Nothing special much. Munna Lv. 1 - Comes with Synchronize - Note, this Pokemon must be ordered upon request. Pick the nature you want. This special entry is reserved for all the Deino and Larvesta I am offering to trade. They will always have at least 1 IV that is a 31. Generally it will be HP, but it is allowed to make a special request for a different 31 or even multiple 31s. A special nature can also be requested if you don't see it below on this list. You can also ask for their IVs which are not 31 and I will check them for you. All Deino come with Tackle, Dragon Rage, Thunder Wave, and Dark Pulse. All Larvesta come with Ember and String Shot. Larvesta Lv. 1, Bold, Male - 31/x/x/31/31/x IVs, "Outstanding potential"
Larvesta Lv. 1, Mild, Female - 31/x/x/x/31/31 IVs, "Relatively superior potential"
Larvesta Lv. 1, Timid, Female - 31/x/x/31/x/x IVs, "Relatively superior potential"
Larvesta Lv. 1, Timid, Male - 31/x/x/31/x/x IVs, "Relatively superior potential"
Larvesta Lv. 1, Timid, Male - 31/x/x/x/31/x IVs, "Relatively superior potential"
Larvesta Lv. 1, Timid, Male - 31/x/x/x/31/x IVs, "Outstanding potential"
Larvesta Lv. 1, Timid, Female - x/x/x/x/31/31 IVs, "Outstanding potential"
Larvesta Lv. 1, Timid, Female - 31/x/x/x/x/31 IVs, "Relatively superior potential"
Larvesta Lv. 1, Timid, Male - x/x/x/31/x/31 IVs, "Relatively superior potential"
Larvesta Lv. 1, Timid, Male - x/x/x/31/x/31 IVs, "Above average potential"
I wish the spoilers here were like actual boxes that you could expand and contract, but unfortunately they aren't. Sorry. Last edited by DNA on Fri Aug 02, 2013 9:47 am, edited 70 times in total. Glad to see that you have a shop -I may not be your first customer, but I would like to place an order for a couple of things. And so you know you do have the right to deny any of my requests. I will pm you shortly with a list of wants/haves. A few questions first. I've seen and read your PM. First off, are you going to trade the shinies into Gen 4 or Gen 5? (And I am assuming they are legit.) Gen 4 is preferred since I can clone them from there, but whatever you wish is fine. And do I get to pick a nature I want, or only the species? As for Pokemon with 3 or more 31s? So far the Deinos and Larvestas are the only ones I have; I could TRY to open sections for Solosis and Sigilyph as well, as I believe I can get babies with 3 31s for those, but I haven't started to do either of those yet professionally. If demand rises, however, I will consider doing that. Hi I was recomended by mallratdogma , I am looking for a shiny event Entei, the gamestop one you have is good. It will be for my gen 4 game in return I offer a legit Victini for gen 5 if you respond i'll tell you the natures I have left. I restarted the game alot of time during the event so all of them are legit they all bring a fire gem if am correct and all are untouched. Let me know if you can do this trade ty. I'd prefer a Jolly one if you have one around, and I'd like to know its IVs as well (since I may want to EV train it). If that's not acceptable, what else do you have for trade? Ok if I dont have it right off the back, i'll have it in a day or 2 after I soft restart for it lol. As far as e.v. I wouldn't have the slightest idea, all of them came at lv 50. But if this helps they are all untouched still, none has been trained with the exeption of my original Victini but that one isnt for trade lol. I know you said they were untouched - that implies that all its EVs are at 0. I just want to know the IVs. Calculating at level 50 will only give an error margin of 1, which is fine for me, plus the Judge in the Battle Subway can tell you which ones, if any, are 31s. I know that bumping is allowed (once per, what, week, is it? ), and although it's not encouraged, it's been a month since the last post in this thread, and during that time I've been making a bunch of small additions and such - I actually regularly edit the title to reflect the last update time. Any chance you'll be hatching eggs from the Adamant Extremespeed Dratini you recently acquired? I would like one of the same, also male. I have a Quirky Ditto you can have, and I'd be happy to TRY to find a way to breed Rapid Spin onto Tentacool. Let me know wha'cha think. Edit: I have a Kabutops with Rapid Spin that I can breed with Tent if you like. Assuming you want a male? Nature? Ability? I only have the one EV'd Kabutops, so I really don't want to part with it. I am very interested in your DW Clamperl. I have a DW Surskit (The level 10 one has Hydro Pump, but if you want I could get you a newly hatched one) and a shiny Lunatone. I can also give them an evolutionary stone (preferably a Shiny Stone and a Dusk Stone). I can also possibly get a Male Budew with Worry Seed for your Cottonee. I probably will, actually, seeing as ExtremeSpeed Dratini's in rather high demand. Not quite sure when I'm going to go about it, but I'll try to do so ASAP. The males are the ones that pass on the egg moves, so yes, I'd want to have the Rapid Spin user be male. As long as the DW Surskit is female, I'm fine with it, regardless of whether or not it has any special moves. As far as evolutionary stones go, I'm always willing to accept those, since it's very difficult to get more. And a male Budew with Worry Seed? Sounds promising! I'll give it some thought. I do not know whether or not I edited this into the OP, but in any case, I do not currently have my Black game on me - I have not had it since June 23, and it is currently in possession of a friend. If all goes well, however, I should be able to get my Black game back by this Saturday, July 14. Until then I can't conduct any actual trades (or preparations thereof, sadly), but I'm still able to negotiate. Just be aware I won't be able to get things ready for you both right away. I have your Tentacool w/ Rapid Spin. I leveled a Rash one to 26 so that you'll have more time in the DC before it's moves get deleted, since you are using it to breed. Also kept a Lv 1 Calm just in case. Will breed any nature if you so desire. In the meantime, I am also interested in your Jiraci Lv. 5 -Rash, Neuter-OT SMR2010, ID 06260, holding a liechi berry. Would my previous offer be 'fair'? So the things of mine you want are a Jirachi and a Dratini, and the things of yours that I want are a male Tentacool with Rapid Spin and the Quirky Ditto. Was that the offer you were referring to? That is correct, if you feel that is a fair trade. Sounds reasonable! What's a good trade time for you? Sometime next week would probably work best for me. I will check back with you on Tuesday of next week, 7:00 pm and onward. If things get hectic and you don't have time for breeding, that's fine. No rush on my end ... we'll just work out another time. Tuesday 7pm and onward? I'm assuming you mean Pacific Time, since those are the times I use. Sounds good to me! I'll get them both ready. "Celebi Lv. 50, Quirky, Neuter - OT EIGAKAN (Japanese), ID 07100, holding Jaboca Berry - Unlocks Zorua in B/W"
Does your Celebi trigger the event with the Shrine in Ilex Forest, HGSS ?? I can think i can offer an Embedded Tower - Groudon. I haven't tried yet (since I myself have not gotten around to doing the Celebi event in my own HGSS), but it should be able to. If not, I'll refund you. Ooh, an Embedded Tower Groudon! What's its nature, IVs (if you know them), and EVs (if any)? At the moment of typing, I do not have my DS on-hand, so I do not know any of them yet. But I will reply again asap when i know them. Even though it may have wrong nature etc, you still want it right? Well anyways Embedded Tower - Groudon, has MODEST nature,IVs are, if IV-calculator is right, 26/1/3/19/21/23, it seems UT to me. The IVs can vary with -1 in every stat except HP. So when are you able to trade? I can do it mostly anytime. Okay, sorry for not responding earlier. I'm finally at home now, so I can successfully log in and respond to you all. Dragonair101, I'll try and breed a DW Clamperl to swap for your Surskit. I'll worry about what I want for the Budew later; I'll check your trade thread. FallenLeaf, I've seen your message; I'll peruse your thread and let you know if I want anything else. My Black version is now once again in my possession and, for the most part, fully operational. Gen 5 trading is now once again open for business! if you are going to use it, and competite with i totally understand that you don't want it groudon cause of its nickname and nature. thats nothing i can do about :/ but if it were just for the rayquaza-quest ingame, it works fine, i used it my self. -- exactly why do you think modest is a bad nature? -Atk +SpA. Unless you are planning to relay Fissure and Earthquake, MODEST is a good nature for Groudon. 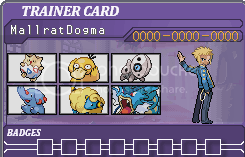 Btw now i have gotten rid of that RAYQUAZA. now i just got a japanese MODEST, Embedded Tower. And this one isn't UT either. Are you sure you don't want it?? how much would it take to pay for all these, in items and/or pokemon? Modest is the worst possible nature for Groudon. It's terrible. Probably a lot. I'll peruse your trade thread and see what I want. Edit: The KEIKO Kyogre and the Naive Latias are possibles. Do you know what their EVs/IVs are?